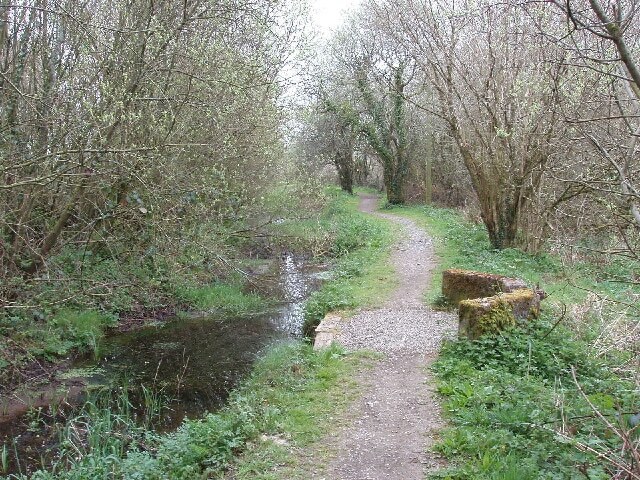 This walk explores an inland section of the Bude Canal on the Devon- Cornwall border. Follow this short circular walk by doing a simple “there and back” walk. Or perhaps try a slightly longer walk which passes more of the Tamar Lakes. The shorter walks are based at the car park at Lower Tamar Lake on the Devon- ornwall border. The slighter longer one starts at the Upper Tamar Lake car park. Both car parks are accessed along country lanes, and are reached by following brown signs from Holsworthy (via Chilsworthy) or Kilkhampton. There is no public transport to the lakes, the nearest bus route being at Kilkhampton, approximately 2.5 miles (4 km) from the car parks. Upper Tamar Lake : car park, toilets, information centre, seasonal cafe, plus water sports and angling facilities. Lower Tamar Lake has car park, bird watching facilities and information and seasonal toilets. The walks are completely level and there are no stiles. The Upper Tamar Lake was constructed in 1977 to help provide water supplies for the area. Today, as well as a water sports centre and angling facilities there is a path around the entire perimeter. The upper lake is used for quiet recreational pursuits, the lower lake is maintained as a bird and wildlife resource. Look out for the bird hide just off the path. Lower Tamar Lake was constructed in the 1820s by damming the River Tamar. It was built by the Bude Canal Company to supply the Bude Canal with water. In more recent times it has, in conjunction with the upper lake, been used for water supply to local settlements. Both lakes are managed by the South West Lakes Trust. The spillway takes the water of the Tamar out of the lake, enabling the river to continue on its course to the sea at Plymouth. The original course of the river would have been where the dam now stands. The Bude Aqueduct was originally constructed purely to carry water to supply the rest of the network. The wharf buildings were used to store coal, sand and manure, the main goods moved on the canal. There was also a wharfinger’s cottage, where the person who looked after the wharf would have lived. Today, the old store is owned by the Bude Canal Trust. It is open to the public and contains information about the history of the canal. Notice also the boundstone on the wharf, inscribed BHC (for Bude Harbour and Canal Company). There are other metal markers next to the canal nearby, one a distance marker indicating 13 miles to Bude. The Tamar is crossed and with it the county boundary, into Cornwall. For much of its length, the aqueduct section of the canal was parallel to the Tamar on the Devon side. Some five miles/eight km downstream it crossed the river on a “real” aqueduct. This route, as far as the river crossing, can be followed on the Aqueduct Trail. During the “canal boom” of the late 1700s, ambitious plans were conceived for a canal to link Bude to the south coast via the Tamar. These failed to materialise, but in 1817 work started on a more modest proposal. This comprised a 2 mile/3 km length navigable by barge from Bude to Helebridge, adjacent to the modern A39. 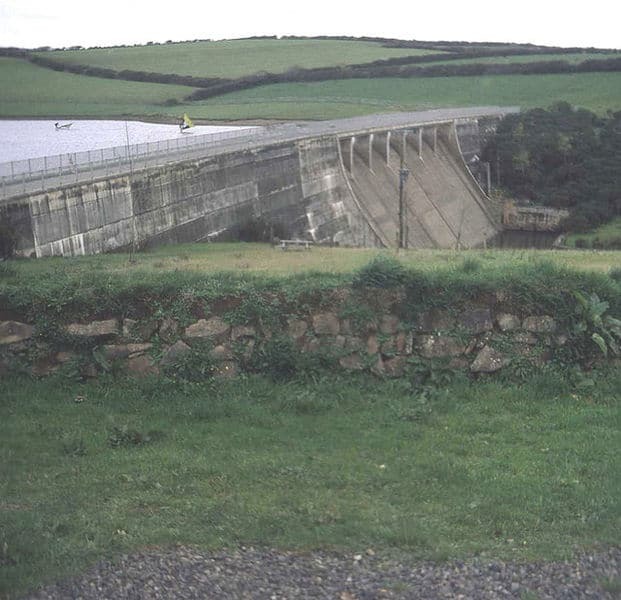 Beyond this length, a total of some 40 miles/65 km of narrow tub-boat canal was constructed with three main branches to Druxton (near Launceston), Blagdonmoor (near Holsworthy) and to a new water feeder reservoir on the Tamar near Virworthy. The branch to the reservoir had originally been planned purely as a water feeder for the canal system. However, a wharf was built at Virworthy and the branch was used, like the rest of the system, to bring sea-sand from Bude to fertilise the soil and to take agricultural produce out. Nevertheless, because of the original purpose as a water feeder, this branch was always known as the Bude Aqueduct. Except for the 2 mile length from Bude, the canal network was used by wheeled “tub boats”. These were drawn by horses then winched over the hills on a system of “inclined planes”. The combination of inclined planes, the sea lock at Bude and other historic features make the Bude Canal very important in heritage terms. The canal closed in 1901 following the arrival of the railway in Bude and the consequent loss in trade. However, the reservoir and the Aqueduct continued to play a role in local water supply until the second half of the 20th Century.